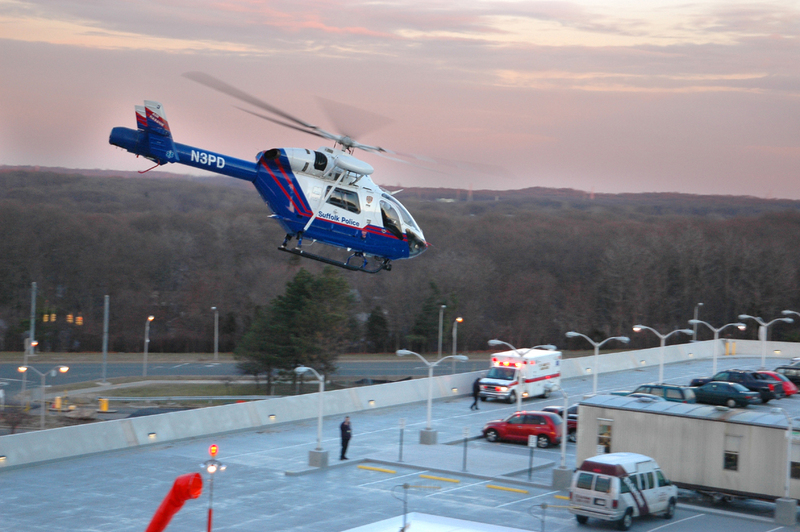 Suffolk County Police helicopter ambulance coming in for landing at University Hospital. Our surgical critical care residency (fellowship) program was first credentialed in 2001 for two fellows per year. The program has, since then, matriculated 16 fellows (i.e., residents). Stony Brook University Hospital has a large volume of critically ill surgical patients and, as part of the mission of Stony Brook Medicine and its commitment to education, our fellowship program was a logical step. The fellowship has been recognized for its continued excellence by certification through the ACGME and the American Board of Surgery. Our SICU has been recognized locally and nationally for many initiatives and innovations in providing optimum patient care. The program continues to grow with input from the attendings in surgical critical care and the fellows. Outside rotations are offered and taken by the SICU fellows. This provides the diversity and necessary experience based on the volume, as demonstrated by the performance of the fellows in all receiving board eligibility and certification when they have applied to the American Board of Surgery to take their critical care boards. In addition to the program director, Randeep S. Jawa, MD, there are eight other board certified or admissible attendings that have primary responsibility in the SICU on a weekly basis. The multidisciplinary approach to the SICU patient makes the SICU a congenial and collaborative environment in which all members of the team play a role in the exemplary care provided. In addition to becoming credentialed in advanced cardiac life support (ACLS) and advanced trauma life support (ATLS), fellows participate in the education of medical students and residents, in addition to the multidisciplinary team that constitutes an IHI approach to the SICU (see Institute for Healthcare Improvement). Weekly didactic conferences, which include journal club, topics on ICU administration and billing, Surgical Council on Resident Education (SCORE) curriculum, and Resident ICU (RICU, offered by the Society of Critical Care Medicine) curriculum are just some of the modes of education used. The diverse patient population includes general and acute care surgery, trauma, vascular, neurosurgery, OB-GYN, ENT, plastics, orthopedics, urology, and renal transplantation, in addition to occasional medical-type codes. This provides a diverse exposure and experience, so that the fellow, at the conclusion of his or her training year, is comfortable in taking care of a hospital’s sickest and most complex patients. For more information, please call 631-444-8329. Questions concerning the application process should be directed to Dr. Jawa at 631-444-8329, fax (631-444-6176) or via e-mail.